Chiral carbons are identified as having 4 unique substituents. Finding the Absolute Configuration – R and S comes as a result of ranking and order substituents, specifically by noting the configuration of the top 3 groups. This video shows you how to prioritize substituents to find R and S configurations using the Cahn-Ingold-Prelog priority rules. 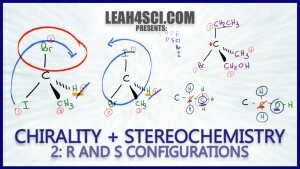 This is Video 2 in the Chirality/Stereochemistry Video Series. Click HERE for the entire series. it is a helpful lesson . Thank you so much for your helpful videos. They are very informative! Hi, I just wanted to say thank you for being a great instructor, your videos are really good, I’m waiting for video #3 on diasteromers and rotation, I’m having a hard time with rotation…Thank You!!! Thank you Jackie. Did you find video 3? Thank you so much. I like the way you breakdown to identify R and S configurations. Hi leah, when will you post the next video in this series? Thanks!